NETWORK FINALS: AGENTS OF SHIELD gained 0.1 in final numbers. CABLE HIGHLIGHTS: ESPN’s afternoon MASTERS TOURNAMENT coverage topped Friday cable at 0.73, with primetime coverage at 0.32. A&E’s LIVE PD returned from a rerun week at 0.60. On Discovery, GOLD RUSH rose 0.04 to 0.43, and BERING SEA GOLD ticked up to 0.34. HBO’s REAL TIME WITH BILL MAHER came back from a week off at 0.38. 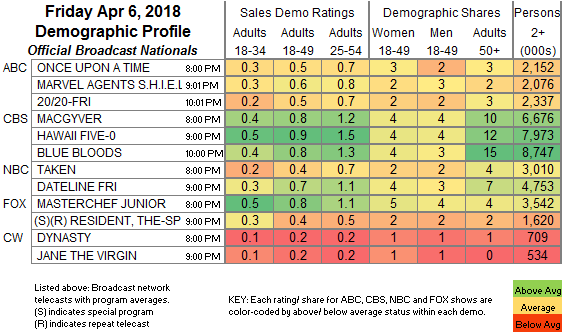 On HGTV, HOUSE HUNTERS climbed 0.09 to 0.32, MY LOTTERY DREAM HOUSE ticked up to 0.28, and HOUSE HUNTERS INTL was up 0.04 to 0.27. 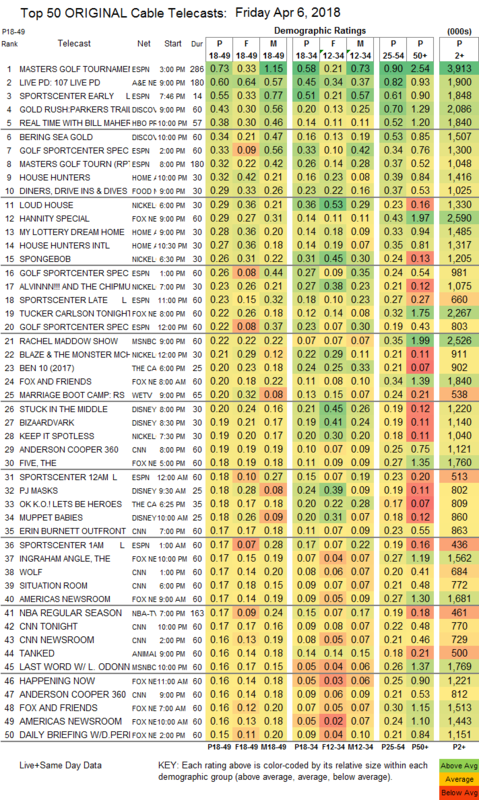 Food Network’s DINERS, DRIVE-INS & DIVES ticked down to 0.29. Nickelodeon’s early evening LOUD HOUSE gained 0.03 to 0.29, and lead-outs SPONGEBOB and ALVIN & THE CHIPMUNKS were respectively down 0.06 to 0.26, and down 0.04 to 0.23. Fox News’s TUCKER CARLSON TONIGHT tied MSNBC’s RACHEL MADDOW SHOW in the demo at 0.22, with CARLSON at 0.32/2.3M in 25-54s and Total Viewers, and Maddow at 0.35/2.5M, both above CNN’s ANDERSON COOPER 360 at 0.19/0.25/1.1M. On We, MARRIAGE BOOT CAMP ticked up to 0.20, and BRIDEZILLAS ticked up to 0.12. Paramount’s BELLATOR LIVE was at 0.14. The season finale of Cinemax’s STRIKE BACK was up 0.01 to 0.03/95K.